Have you been in a Rideshare accident? Car-service and rideshare companies have become increasingly popular for getting from place to place quickly and at a reasonable rate. However, even “professional” drivers make mistakes, and no one is exempt from the possibility of causing or being involved in an auto collision. If you’ve been injured in a car accident while riding as a passenger in a rideshare vehicle, recovery options are available to you. The major rideshare companies such as Uber, Lyft, and SideCar, all typically have $1million-dollar liability policies in place to protect their drivers, customers, and third parties. That is money that you could be entitled to for your damages incurred. Once an accident has occurred, it is vital that you first seek medical attention if necessary, and take down any notes that you can about the details of the crash. Do not talk to any insurance companies or adjusters, as they often will not have your best interest in mind. Your best bet is to immediately contact a knowledgeable personal injury attorney who has experience dealing with auto accidents involving rideshare companies to protect you and fight for your rights. Don’t wait – contact Fenstersheib Law Group, P.A. today for your FREE consultation. 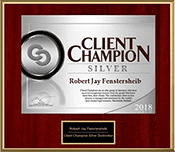 The Tell Robert App from Fenstersheib Law Group, P.A. provides you with helpful resources and easy access to emergency tools that can help in the event of an accident. Contact our law firm to speak with a Rideshare Injury Attorney. TellRobert.com or call 1-800-TellRobert (1-800-835-5762).